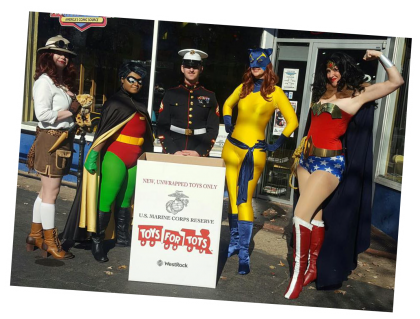 THE HEROESONLINE BLOG | TOYS FOR TOTS 2018 TOY DRIVE!! TOYS FOR TOTS 2018 TOY DRIVE!! HEROES is collecting TOYS for TOYS FOR TOTS again this Holiday Season! Donations of New, Unwrapped Toys can be dropped off at Heroes Aren’t Hard to Find anytime from now until December 14th! We will host a TOY DRIVE with some of our FAVORITE SUPERHEROES on Saturday, December 8th!! It’s certain to be a fun event with festive incentives!! We hope that you will plan to join us that day! ← UNCANNY X-MEN #1 OUT TOMORROW! !